It's debatable whether to call this horror or low fantasy. 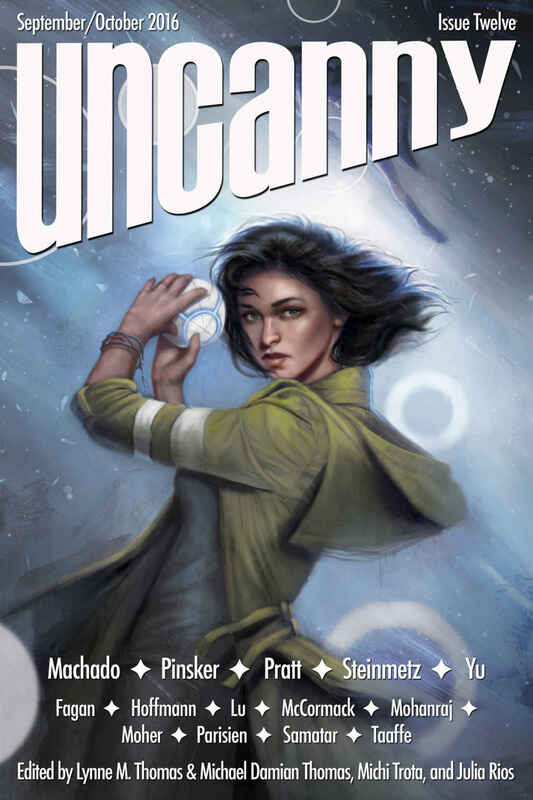 "Under One Roof," by Sarah Pinsker [bio] (edited by Lynne M. Thomas and Michael Damian Thomas), appeared in Uncanny Magazine issue 12, published on September 5, 2016. Pro: Courtney and Josh have a beautiful relationship, and the details of their interactions are the biggest pleasure of this story. It's very amusing when Josh pretends to worry that his wife is a vampire and frets that his parents are expecting grandkids and "they'll want to play with them in the daytime." A theme that repeats is how you learn things about people that you hadn't known. So Courtney is surprised that Josh is willing to break into the attic, but Josh is surprised that Courtney is willing to experiment by throwing the little boy out the window. It's worth a snort that Josh quits talking about them having kids after that. On a different level, you can read the story as a statement about the past. The attic is a concrete metaphor for the way memory often works. You can visit the contents whenever you want, but you can't take them with you, and it's unhealthy to spend too much time there. Con: The resolution is a bit weak. "Okay, we figured it out. Now we'll just work with it."